Day or night the in-room coffee free Wi-Fi and quick highway access make the grade at the budget-friendly Days Inn Tupelo. Coffeemakers microwaves mini-fridges and satellite TV are featured in all 40 rooms at this two-story Days Inn. Free wired internet access and Wi-Fi are available throughout the hotel. The business center provides fax and copy services. The hotel also offers coin-operated laundry facilities for guest use and free on-site parking. 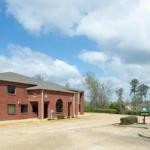 Just one-and-a-half miles south of I-22 guests at the Days Inn are two miles north of downtown Tupelo and five miles from Tupelo National Battlefield and The Mall at Barnes Crossing. Guests are within 10 minutes of Big Oaks Golf Course and less than a five-minute drive north of North Mississippi Medical Center. When traveling in by plane guests are four miles from Tupelo Regional Airport.